Last year, 2015, was the 150th anniversary of Alice’s Adventure in Wonderland, and many countries around the world celebrated the birth of this title character. Fortunately, The UOS Times was able to visit the homeland of Alice, the United Kingdom (U.K.), and it was a really great opportunity to see how people there think about Alice and her part in their lives. Alice’s Adventure in Wonderland is a children’s novel that was written in 1865 by Charles Ludwidge Dodgson, a Mathematics professor at Oxford University. However, his famous pen name is Lewis Carroll. 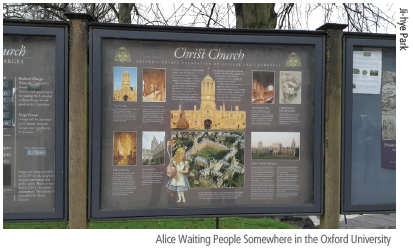 To entertain the Dean of the university’s daughter (named Alice), Charles wrote a story about an adventure in Oxford, and this story has become popular among not only children, but also adults. According to www.alice150.com, a website that celebrates the 150th birthday of this iconic character, the books about Alice, including Through the Looking-Glass and What Alice Found There, are the most frequently cited works in English-speaking countries, referenced even more than those of Shakespeare. This shows that the cultural and literary influence of these books has been enormous throughout the world. As one of the most well-known children novels, Alice was with us in our daily life in the U.K. While in Oxford, we visited Oxford University, which formed the background of the book. I was captivated while walking through the dark and mysterious hall of Christ Church. Additionally, the gloomy weather and scenery of the university created an odd but mysterious atmosphere, as I imagined the Cheshire Cat watching us and smiling on tree. I felt that I was with little Alice while walking along the street at night and going to a pub, called the “Eagle and Child,” which Lewis Carroll frequented. As a children’s book, Alice’s Adventure in Wonderland has been translated into many languages and was brought closer to those who love Alice when it was adapted into a play and musical. 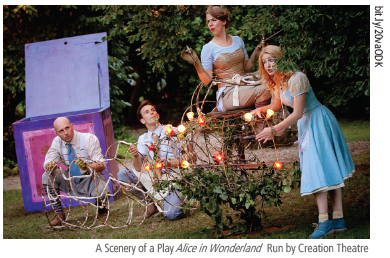 A play, Alice in Wonderland, run by the Creation Theatre in Banbury, Oxford, was the most impressive among performances related to Alice that I have seen. What differentiates a play from other genres is how it actualizes imagination into reality. Therefore, the delivery and physical expression of the story can more easily and effectively affect how audiences understand it. This play developed the plot like the book, but it described each character and scene more creatively. The performers made the best use of the limited stage by appearing behind the seats and climbing the walls to show how Alice followed the White Rabbit. In addition, by using magic, puppetry, music, and acrobatics, the actors naturally drew participation from the audience so that both the performers and audience made stories together. It is easy for us to find traces of Alice in London as well. After visiting Banbury, we went back to London and The British Library to see an exhibition about Alice in Wonderland. Because the book has an interesting story and is full of imagination, many artists have been inspired by Alice’s Adventure in Wonderland, and they have recreated Alice in their own unique styles. Consequently, there are many diverse images of Alice, not only in books, but also in cosmetics, fashion, games, and music. 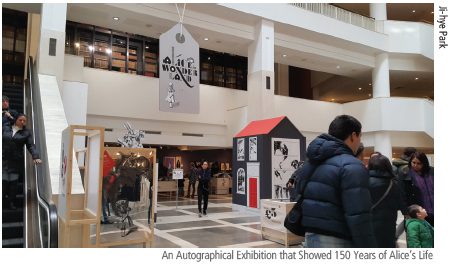 In the exhibition, many re-born Alices from the last 150 years are presented in various forms such as illustrations, music, Internet games, and even the original manuscript of Alice’s Adventure in Wonderland. In addition, the musical wonder.land was shown at the National Theatre, which reinterpreted Wonderland as a blurred virtual world between online and offline while in London. In addition, we saw a lot of daily products showcasing illustrations of Alice, and even tin cases were displayed in the Victoria and Albert Museum. This well-made, classic children’s story can be widely beloved regardless of one’s generation. There are also wonderful children novels in Korea, and people also enjoy these traditional fairy tales or children’s stories when they are converted into plays or musicals. Some Korean traditional stories are chosen as subjects in Korean classes while in school. From these, we usually only have a vague understanding of the main plot and ending of these classic children’s stories. We consider these classic children stories as childish, with plots that are too obvious. However, imagination can make a simple plot more creative. New ideas or viewpoints from different generations can also apply to an old plot and make the story more colorful. In other words, an unconventional retelling of an old story can change a common novel into an everlasting and beloved one. Therefore, it is important to recreate traditional Korean literature so that it becomes the property of younger Korean generations, as well as others all around the world.